Using the right fertilizer can go a long way for a beautiful and healthy landscape. Greener Horizon has the expertise to inspect and care for your landscape with the right fertilizers year-round. You might be sitting there wondering – what does it even matter to have the right fertilizer? Even more goes into fertilizer than you might think. It matters what type of grass you have, the timing of use and of course the right kind of fertilizer to go with. 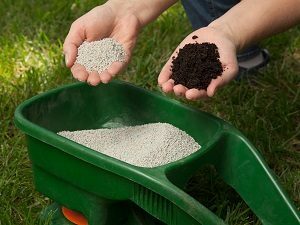 The seasons in New England can be very tricky, so making sure to lay down the right fertilizers to grow strong healthy grass can take quite some effort. Substances that are crucial for plant life to grow are found in the fertilizers that are used to keep your lawn up to standard. Nitrogen, phosphorus, and potassium are the main ingredients of your fertilizers. You can use organic or chemical treatments for your lawn which is where the environmental impact comes into play. All variables should be considered when applying the right kinds of fertilizer from kids, all the way to pets. Nitrogen promotes healthy leaf growth by encouraging the production of chlorophyll, which is a chemical vital to photosynthesis. Phosphorus helps your lawn develop healthy roots and stems. Potassium gives your lawn strength, helping it to resist drought and disease. The appearance and type of your grass has a lot to do with the type of fertilizer you should go with. The many different grass types will have different growth periods. There are warm and cool grasses that can be found and grown in New England. For warm season grasses, it is good to feed them from late spring to early fall. Cool season grasses tend to grow more rapidly in the cooler months. It’s important to feed the grass at the right times because you can cause damage to the growth if you don’t. If you don’t fertilize at the right time, the grass can take more harm during the harsh winter months and lead to more effort, time, and money to repair. Everyone wants to save time and money when it comes to lawn care! When you have the knowledge and skill that we obtain, we can go to great lengths to avoid wasting your time. With the right amount of effort, the landscape can be an easy and very manageable process. Knowing the right way to apply the fertilizer as well as when to apply it is something that has been built from the expertise of the Greener Horizon staff. If you’re interested in getting the right kind of fertilizer and would like to have your landscaped managed, don’t hesitate to contact us. Don’t waste your time and money on products you are unsure of! You can set up a consultation with us today. Let’s keep those luscious green lawns thriving.